The head should be in proportion to the Donkey. A shorter head is preferred to a longer one. 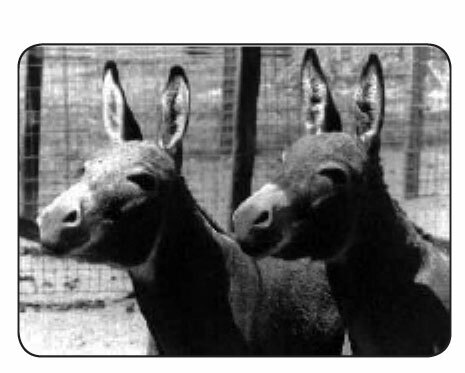 The Donkey should have a broad forehead and width between the eyes. The muzzle should taper with firm, even lips and large, open nostrils. The profile should be straight or slightly dished. Eyes are ideally large, prominent, dark, clear, with symmetry and a kind expression. Ears are preferred long, but in proportion to the head, parallel, set upright and carried alertly. The head should be well-balanced and carried in an upright position. A large head that is not in proportion to the body may indicate dwarfism, which is to be avoided. In a desert environment large ears were adapted to help cool the body and to assist hearing over long distances. Eyes that are small, light colored or dull may indicate poor vision or ill health. Wide set, prominent eyes allow for wider field of vision. Large, open nostrils allow for optimum breathing with the ability to take in an ample supply of oxygen. Drooping lips can be a sign of ill health or age; a protruding or a receding jaw can interfere with eating and may indicate uneven bite.